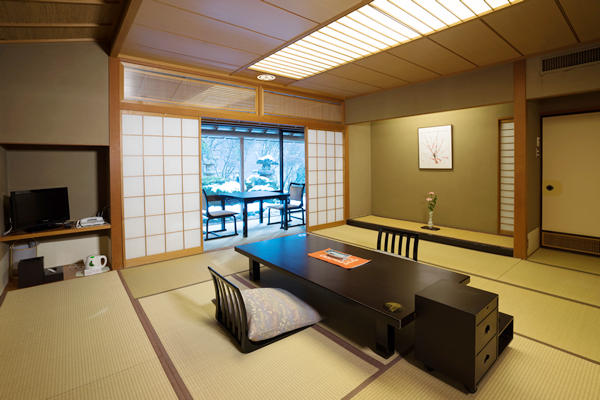 Guestrooms｜An authentic ryokan in Tohoku Tsunagi Onsen near Hiraizumi, Hachimantai and Morioka. A new guestroom opened in 2015. 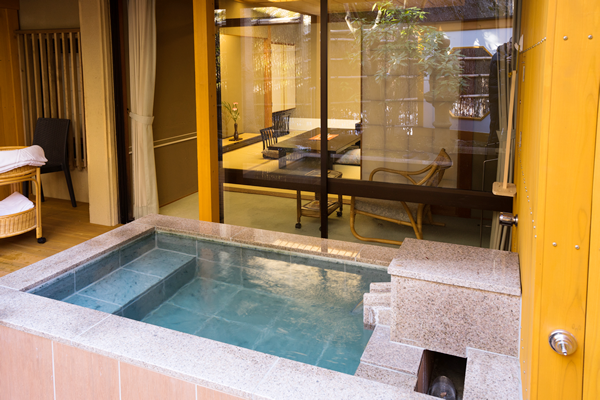 You can unwind in a nice open air hot spring bath, a private space all to yourself. In order for our guests to have a more comfortable stay in Japanese-style rooms, we have arranged 3 rooms with twin Simmons beds. 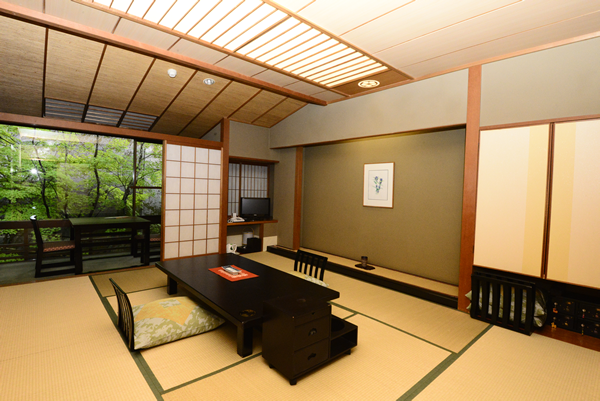 size of 12.5 tatami mats, a twin bedroom and extra space. 8 people can stay in the suite. It is popular with families and groups, especially women groups. It is equipped with cypress bath. 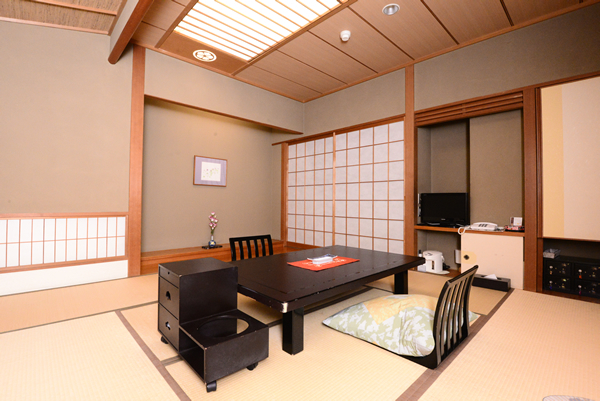 A cozy and elegant Japanese style room size of 8 tatami mats, best for couples or solitary travelers. It is close to the large indoor bath. A standard guestroom of the hotel. 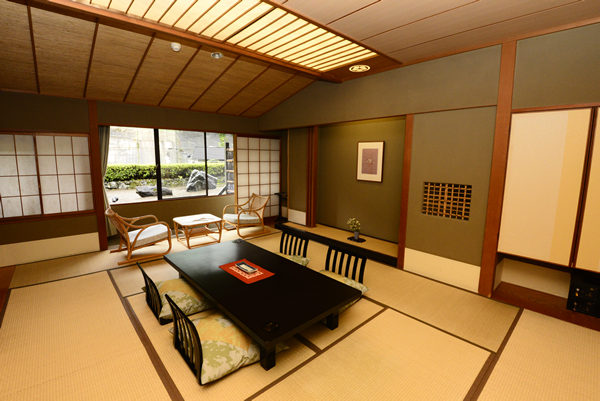 One can feel the traditional Japanese hospitality everywhere in this Sukiya-style (tea-ceremony style) room. There is a table on the broad veranda by the window where you can enjoy reading or working. 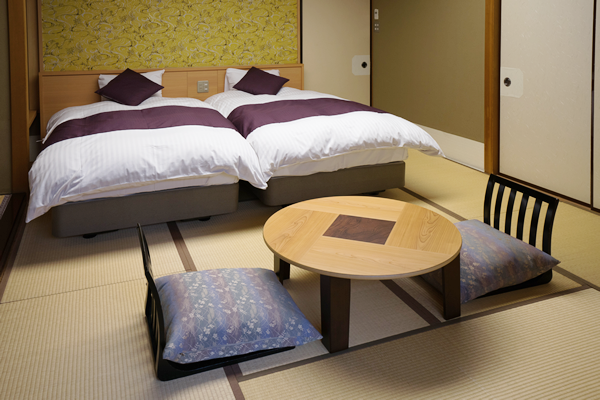 A spacious room size of 12 tatami mats for families, friends or couples to fully enjoy a comfortable stay. Copyright 2016, Morioka Tsunagi Onsen, Shikitei.